My week so far has been hectic, both at home and at the office, and our last couple of dinners have reflected that. The weekend’s snowfall has led to bus snafus and train delays, making my long days even longer, and by the time I have gotten home at night, I’ve found myself in a mad rush to both get dinner on the table at a decent hour, and to finish cranking out edible holiday treats. 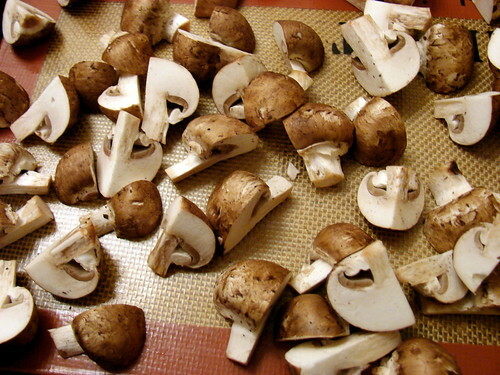 As most of our fresh food is earmarked for holiday meals, I’ve relied heavily on pantry staples for these last two dinners, and since we’ve been dialing back on meat in anticipation of the rich dishes we’ll be indulging in over the extended holiday weekend, I turned to mushrooms to lend a hearty bite. 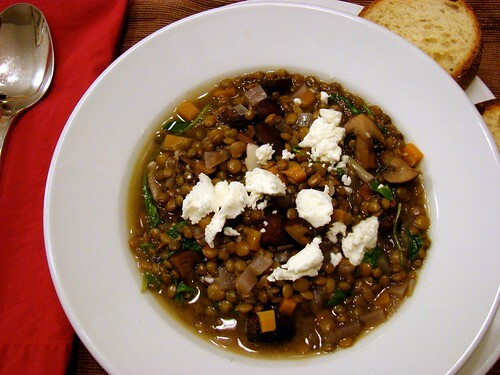 On Monday, my latest incarnation of lentil soup got extra heft with a topping of roasted criminis, and brightness from a crumble of tangy fresh goat cheese. 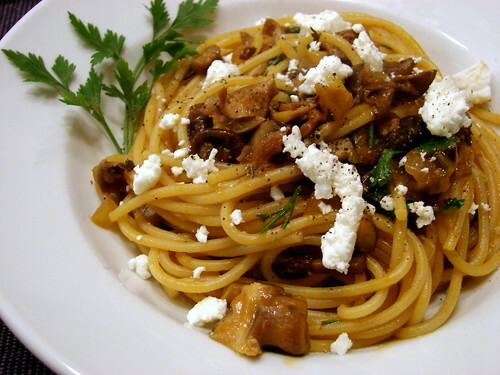 The goat cheese came into play again last night, to both brighten and add a bit of creaminess to bowls of spaghetti tossed with one of my favorite old standbys, a rich mushroom ragu. While these two meals made for a couple of very brown plates, they made for two very satisfying dinners, and this time of year, that’s good enough for me. I’m loving your mushroom ragu. Hooray for brown food! 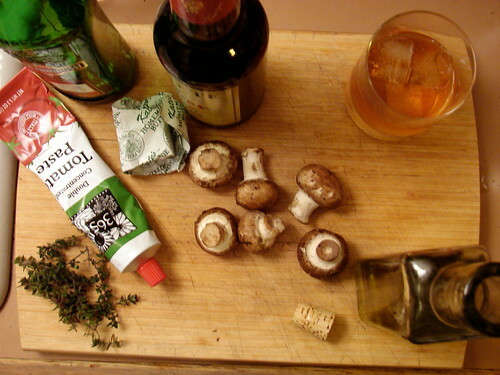 I love the combination of mushrooms, thyme and goat cheese, too. It often finds its way into polenta in my house. Happy holidays and best wishes for the new year. 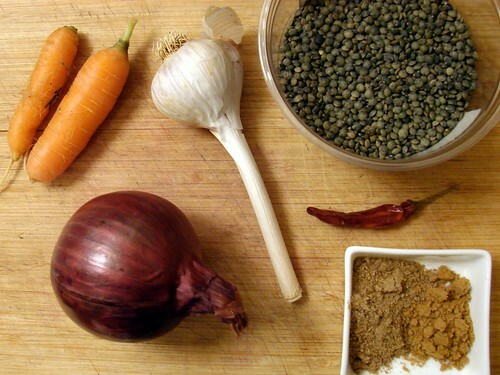 I’ve never thought to add goat cheese to lentil soup, but I’m definitely going to do that now! Great ideas, as always. Tomato paste in a tube? Brilliant! Where do you find that!?? I love, love, love goat cheese. Yum. The lentils sound wonderful. I do a variation of lentil soup with cumin, chiles and tomatoes, and then top with a little greek yogurt and cilantro. One of the few almost vegan meals that I can get the husband to eat. Lydia – Happy Holidays to you and your family as well! MrsW – I really loved how it worked with the soup – and thanks! Erin – I got this stuff at Whole Foods, but I’ve gotten it from other supermarkets and at Italian groceries as well. It’s great stuff, and I’ll never go back to canned.